Mid-century modern decor throughout home. Living room with large TV and gas fireplace. Dining room with beautiful artwork and large windows. Bedroom #4 Green room with queen sized bed. 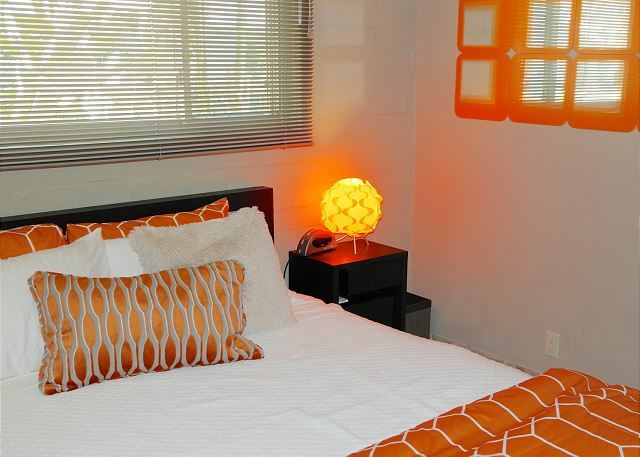 Bedroom #3: Orange room with queen sized bed. 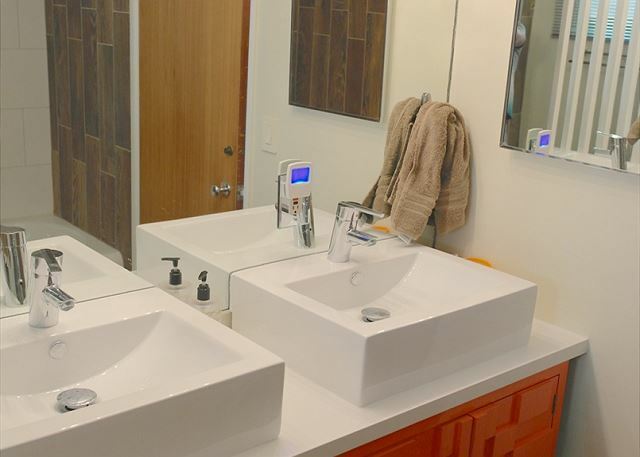 Master bath with his and her sinks. 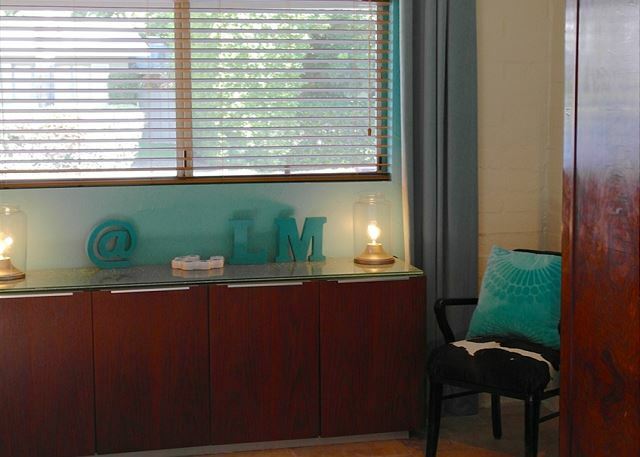 Escape to Lorenzo Modern: Your Private Retreat in the Desert! 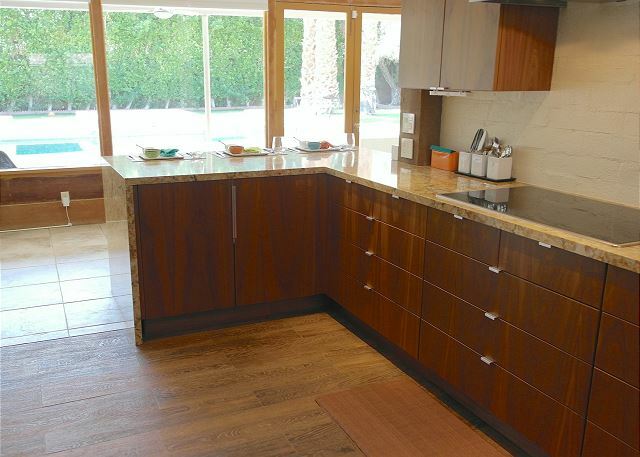 Lorenzo Modern was built in 1949 and is one of the original Trousdale homes. 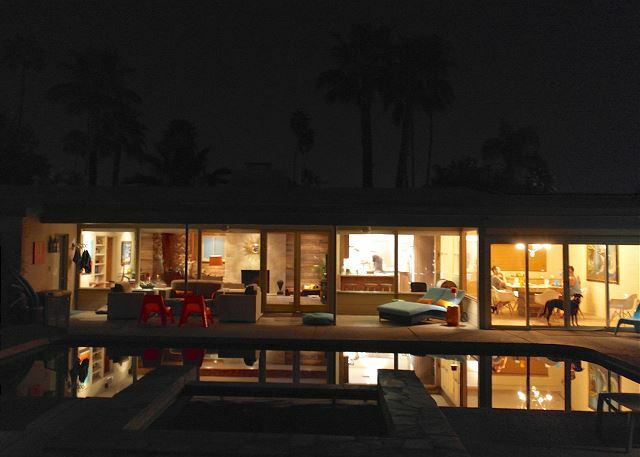 These homes represent the start of the Modernist movement that would come to define Palm Springs. 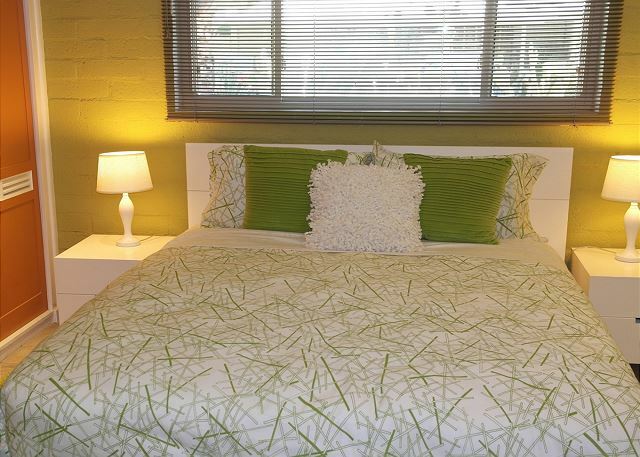 Lorenzo Modern has two master suites for a total 4 bedrooms and 3 baths. 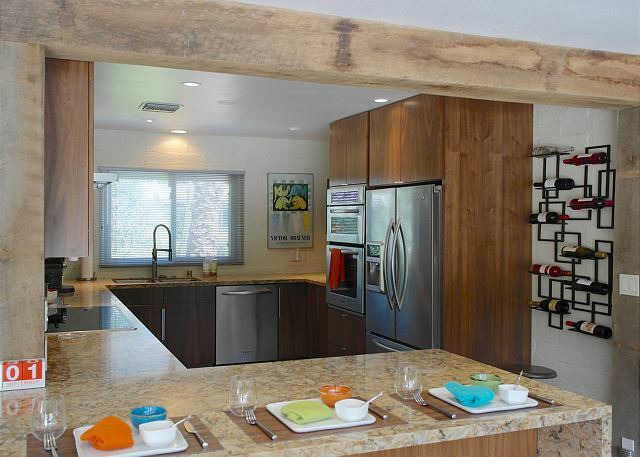 This home has been painstakingly remodeled in the latest modern style. Eco Modernism. 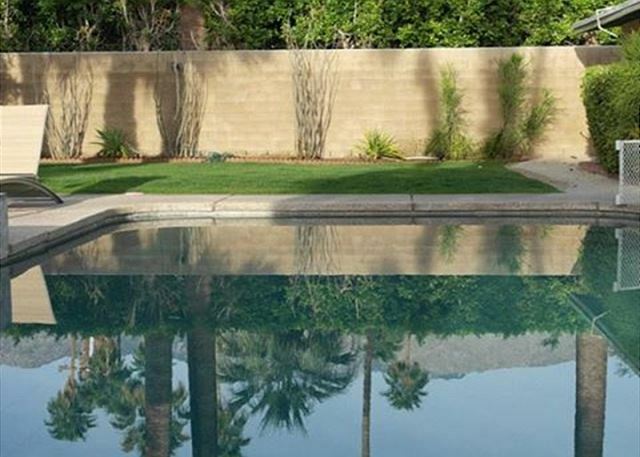 Palm Springs has always been at the forefront of the Modernist movement in the United States. Lorenzo Modern continues that trend. Peruse the latest Dwell magazine, and you'll see the elements that define this latest iteration of Modernism. 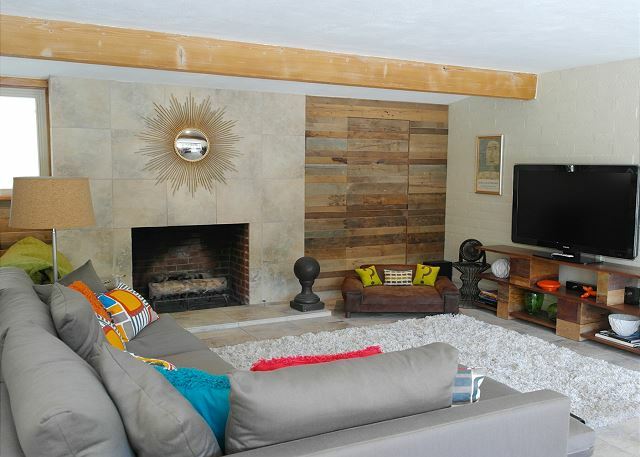 Clean mid-century lines blend with the warmth of reclaimed lumber and repurposed materials. 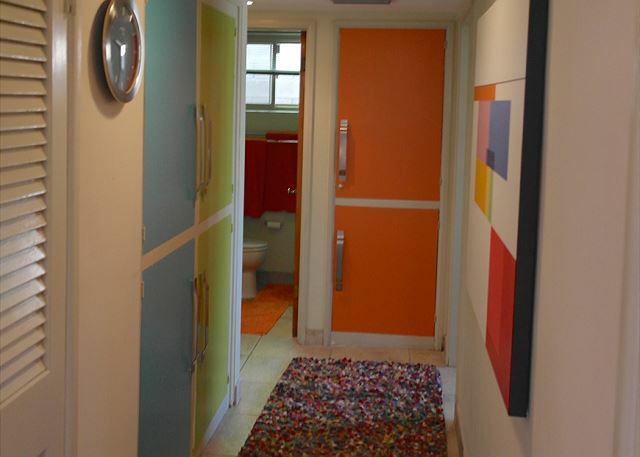 Bright vibrant colors - turquoise, orange and lime - serve as a counterpoint to these natural and vintage elements. Lorenzo Modern has one of the largest backyards of any rental home in its class. 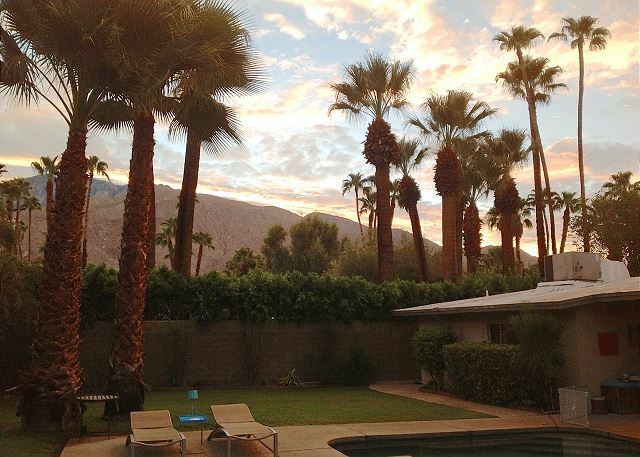 This backyard provides the vacationer many options to enjoy the 350 days of sunshine that make Palm Springs world famous, all while enjoying one of the best views possible of the San Jacinto mountain range. Soak in the elevated spa that waterfalls into the salt water pool. Float around on one of the luxury floats. 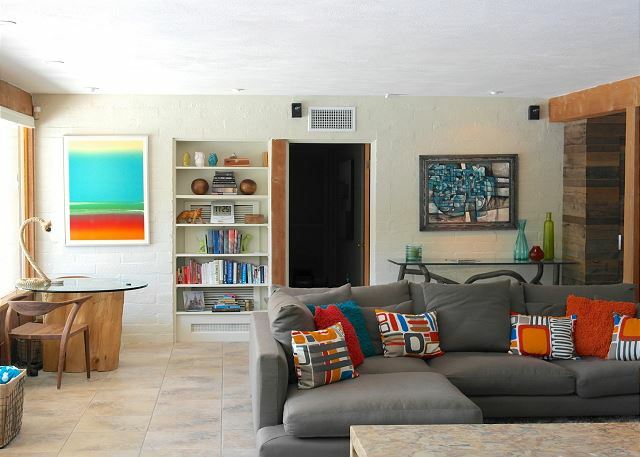 Relax in the double-chaise lounge or on one of the comfortable sofa and chairs under the covered lanai. Sun your front or back on one of the new chaise lounges by the pool. BBQ for family and friends at the built-in grill and then enjoy dinner at the outdoor dining table. Inside the options are also limitless. Watch TV with the family in the main living room, with a 55 inch HDTV and DIrecTV. 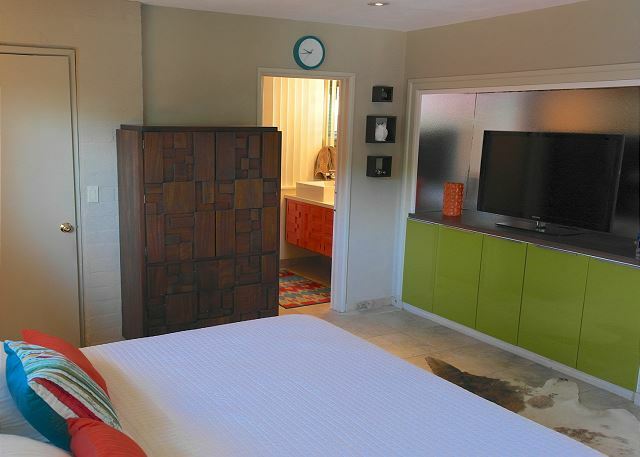 Relax in one of the four bedrooms (All of which have TV and DVR). 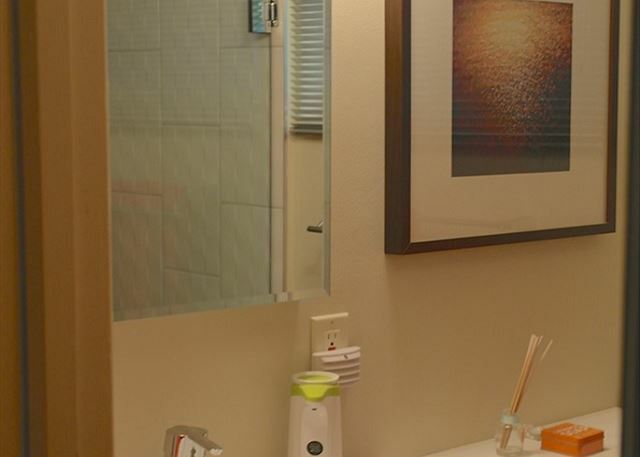 Enjoy a rain shower in one of the newly remodeled bathrooms. 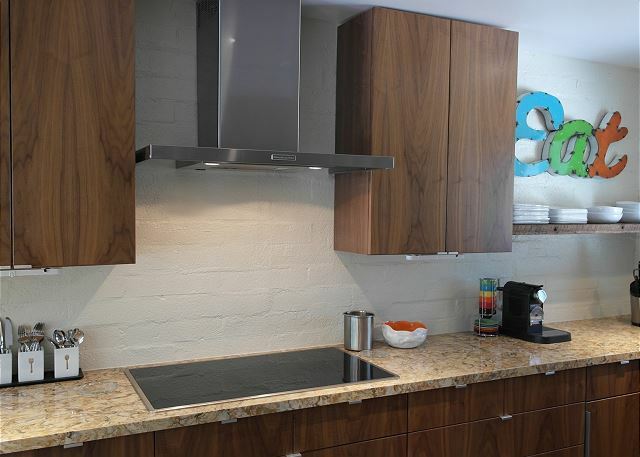 Cook like a gourmet chef in the brand new kitchen, complete with high end KitchenAid appliances, quartz countertops and everything else you'll need. Dine in our family sized dining room at the reclaimed lumber table under the one of kind atomic chandelier. Use your computer or iPad anywhere in the house or outside by connecting to our Wifi. Rates: Weekend rate Friday/Saturday is $650.00 p/night. Weekday rate Sunday thru Thursday is $600.00 p/night. 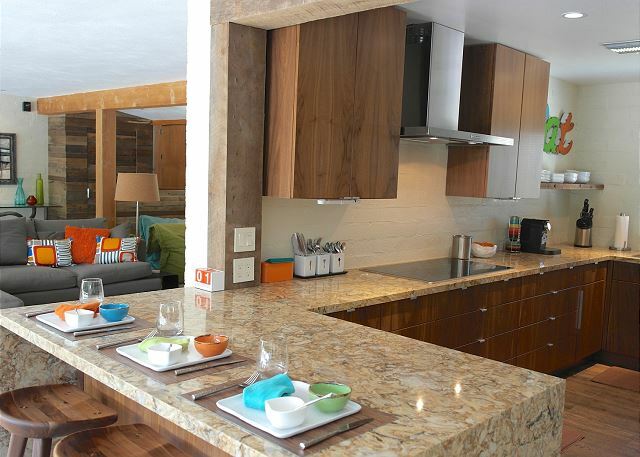 Winter Holiday rate $850.00 p/night (Thanksgiving, Christmas and for New Year's, with a 4 night minimum). 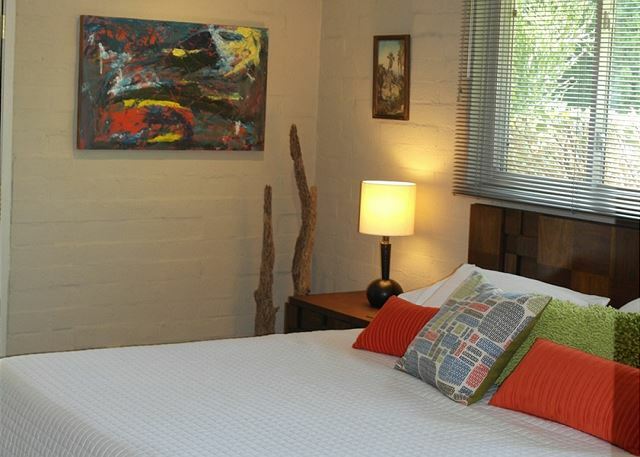 Holiday rate $825.00 p/night, a 3 day minimum may be required. Call us for our weekly/monthly specials. Pets are welcome. Pet fee will apply. Linen/Prep fee $400.00. Approval will be needed for one-night stays after booking request has been submitted. 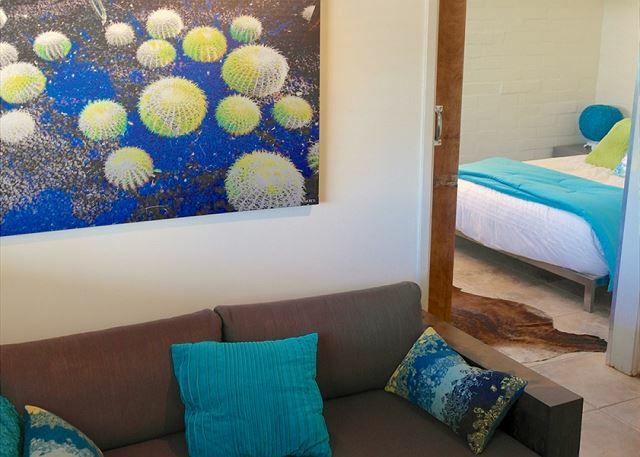 One night stays can be done for same week reservations (If booking far in in advance and requesting Friday-Saturday-Sunday nightly rate may be higher with the accommodation of early check in or late check out) Higher rate may also apply to Monday-Thursday when booking in advance.